The character DLC page is just a part of our in-game catalog. 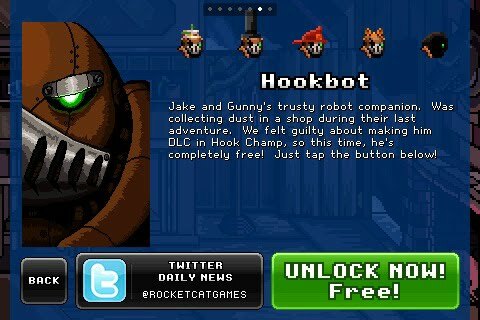 Just scroll to Hookbot's page to unlock him. He's free. It's a secret to everybody! Except for people that saw this blog post, the last post, the twitter announcement, or people that just look at his DLC page. Eruption Mode - The sequel to Avalanche Mode, and just as big. Features all new landscapes based on the Fungus, Ruins, and Lava levels. Eruption abandons secret paths and concentrates on pure survival. 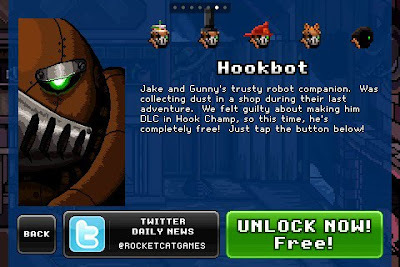 Three All New Unlockable Characters - Gnomey, Aldora, and Hookbot. 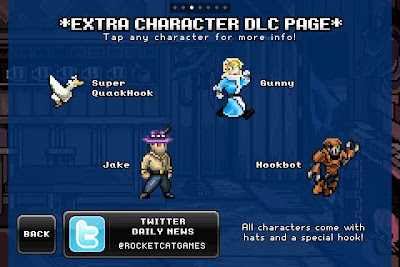 All new characters have new hats and their own signature grappling hook! Three New Paid-DLC characters - Jake, Gunny, and Super QuackHook. Learn more about them in the Rocketcatalog. Almost all the new characters have their own signature rocketboots visual effect. More achievements! More hats and grappling hooks! New rewards for getting the more difficult achievements! Finder of Secrets Gold, and all other achievements, are now possible to get. Tons more dialog in the shop. All the characters can talk with the new characters, and all new characters can also talk with the other new characters, leading to a lot more conversations. Super Ultra Secret Level, so secret that I'm mentioning it in the patch notes. Racing-ghosts' ropes have been made less obtrusive. New Performance Mode for people that were having lag problems. Let us know if you still experience lag... the small percentage of people that have lag problems will be our focus in the next couple updates. Coming as soon as Apple approves it! Great Job RC! It was a blast to test it. Every time I go to Eruption Mode as QuackHook and walk to the left, the game crashes to the home screen. I have no idea why it would crash in that case, since the beta worked fine... it's affecting a bunch of people, so there must be a bug. Kepa, is this only a hard achievement, not? Hmmm... so I bought the Jake dlc and it is mostly awesome but it would seem that it is impossible to beat unknown fate with him? On the part where you are sliding under three sets of spikes in a row, he is too big or something and he can't make it under all three. I never had any problem with the original characters but Jake can't get through. Maybe it is that he is a little faster? I switched back to Jakob and everything felt slower and I got through the three spikes in one shot (Aldora also could not get through).